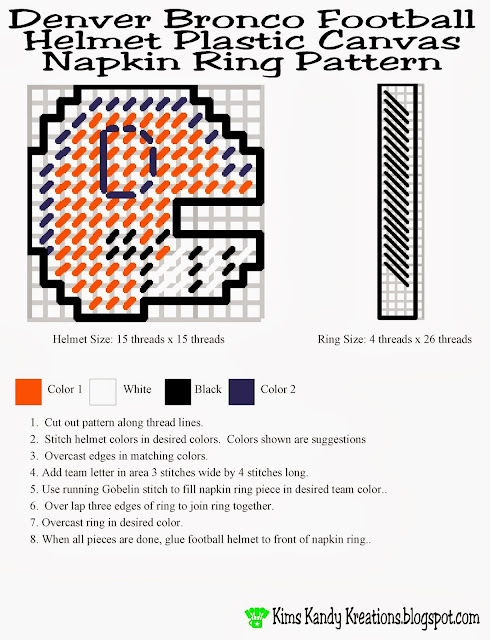 Make these plastic canvas napkin rings for your football party. It's so easy to customize them to be able to root on your favorite team this football season. I don't know if it's my Mom Genes or just my nature, but I don't like to sit around doing nothing. My hands just always seem to need to be busy. So when I sit down to watch football, or any other TV show, I need something to do. 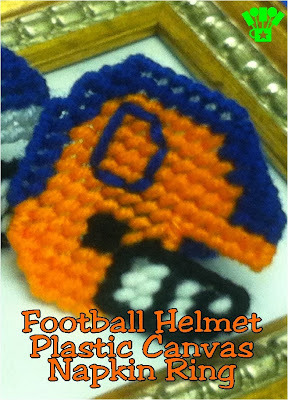 These plastic canvas football helmet rings were a result of needing something to do while watching football this year. I knew they would be perfect for our Super Bowl party table, so I created a new pattern for the napkin rings. I designed up a helmet looking shape for the front of the napkin ring. Who knew that would be so hard? It sort of looks like a Pac Man face with a crazy jaw. 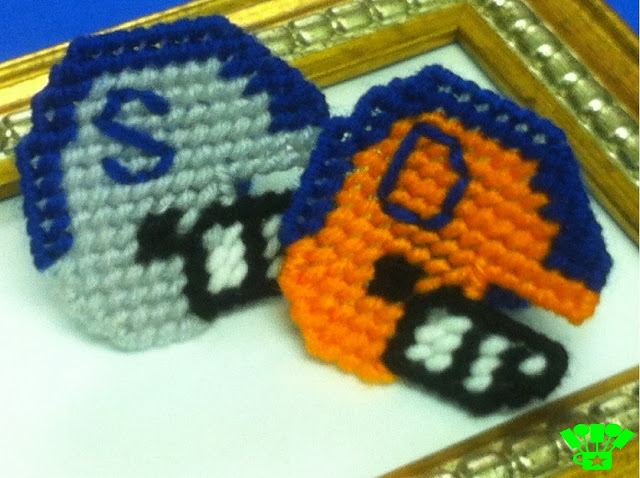 There was no way I was going to be able to sew the Bronco logo onto the helmet, so I settled for adding the team letter. This makes it a lot more versatile also. 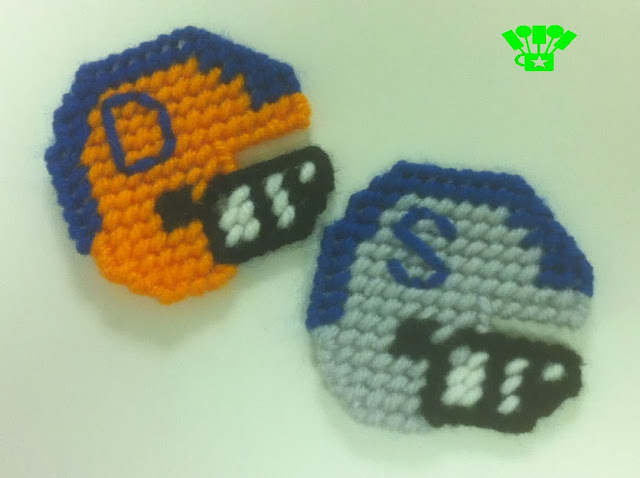 If you want to sew these for a team party, you can just change the colors to match your team. I did get a little advanced in overcasting the helmet in matching helmet colors. The face mask part is overcast in black. The helmet stripe on top is the same as the stripe color. The rest of the helmet is overcast in the same as the main part of the helmet color. The napkin ring is a simple 26 hole by 4 hole piece of plastic canvas with a running Goblin stitch.. 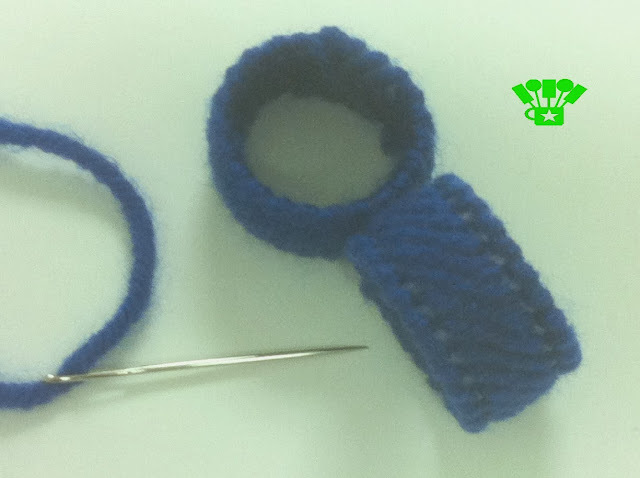 Overlap the last three holes with the front three to complete the ring and over stitch the ends. It's a pretty fast and easy pattern. I finished these up in less than a half hour. I can't wait to see how they look on my table! These are so cute! Would be perfect for a football birthday party. Of course O would need them in orange and black with Bengal stripes, lol.